Chemistry is the study of the composition, structure properties and reactions of matter, so the study of chemistry is central to understanding many other scientific disciplines. All human activities deal with a material world, which consists of chemicals, both natural and manufactured. Chlorophyll, hemoglobin and insulin are examples of natural chemicals that are essential to life. The colors used by painters, the electronic components in computers and the active ingredients in modern medicines are examples of manufactured chemicals produced by chemists. Chemistry is one of many excellent academic programs at Ohio State and is ranked as the best chemistry program in the state of Ohio. The Department of Chemistry and Biochemistry has been ranked among the top chemistry departments in the nation by The National Research Council and U.S. News and World Report. Consistent with this strong standing, the department’s faculty includes one member of The National Academy of Science, twelve recipients of an NSF Career Award, fifteen fellows of the American Association for the Advancement of Science, six fellows of the American Chemical Society and two Ohio Eminent Scholars. The Department of Chemistry and Biochemistry has been recognized as a national leader in efforts to attract and retain women and under-represented minorities. The latest national rankings show Ohio State tied (with Purdue) as #1 in the number of women faculty and is ranked #4 in the percentage of minority faculty. The department receives more than $12 million in federal research funding annually with approximately 90% of the faculty supported by federal research grants. In addition to excellence in research, the department has a long tradition among its faculty of teaching excellence. The courses at Ohio State are exciting because our faculty are actively involved in the current research that helps define this rapidly moving science. The quality of the teaching is reflected by the fact that our faculty have received numerous awards for teaching and mentoring undergraduate students. For more information visit the Department of Chemistry and Biochemistry website or view the university's major curriculum sheet. Have a question about Chemistry or want more information? Let us know. The contributions of chemistry to modern society occur in such diverse fields as pharmaceuticals, polymers, agricultural chemicals, petroleum products and biotechnology. Chemistry also plays a role in cleaning up the environment, improving methods of producing, processing, and packaging food, and making automobiles safer and more fuel-efficient. Thus, a world of opportunities awaits the student who majors in chemistry. Chemists are employed in industrial, government and academic positions. Chemistry graduates find positions in research and development, analytical services, quality control, chemical sales, and marketing. Chemistry graduates with education credentials are in demand to teach in high schools and middle schools. Chemistry majors earning a Bachelor of Science degree often go on to graduate school to earn a master’s or PhD degree. This course for non-science majors explores how chemical concepts interact with significant social, political, economic, and ethical issues facing society today. Topics include Climate Change and Global Warming, Energy of Fossil Fuels, Alternate Energy Sources such as Ethanol and Solar, Chemistry of Chocolate, Air and Water Quality, and Forensics. General Chemistry is a fundamental physical science course in which students study essential chemical principles and also conduct experiments with the knowledge learned from lecture. It covers dimensional analysis, atomic structure, stoichiometry, chemical reactions, thermodynamics, electron configuration, bonding, molecular structure, phases, kinetics, chemical equilibrium, solubility, electrochemistry, and nuclear chemistry, etc. Through the study of Organic Chemistry, students will be given the opportunity to master a number of chemical concepts and problem‐solving strategies and to develop an understanding of the common functional groups, physical properties, bonding, structure and conformations, stereochemistry, preparation and reactions of organic chemistry. The question on the table is: What if testing yourself for cancer or other diseases were as easy as testing your blood sugar or taking a home pregnancy test? 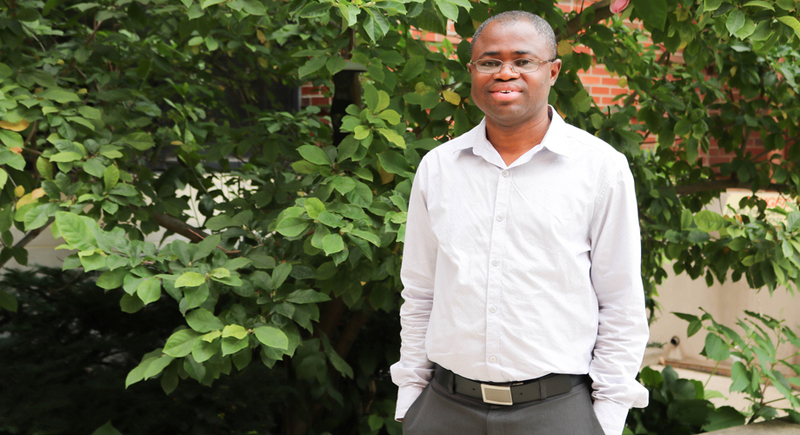 “In a few years, it could be," said Abraham Badu-Tawiah (Badu), assistant professor of chemistry and biochemistry, who developed a new, low-cost, proof-of-concept paper strip that can reveal the presence of malaria or cancer antigen in the blood. The inexpensive paper strips start out as sheets of plain white paper stuck together with two-sided adhesive tape. Wax is used to form a waterproof barrier that captures and keeps the blood sample safe. One 8.5-by-11-inch sheet of paper can hold dozens of individual tests, which are cut apart with a paper cutter. The result: test strips roughly the size of a postage-stamp. With the development of this technology, testing for cancer or other diseases could be as easy as checking your blood sugar or taking a home pregnancy test. “People could apply a drop of blood on a paper strip, at home, mail it to a laboratory on a regular basis — and see a doctor only if the test is positive,” says Badu. Badu believes these strips are an affordable way to put malaria diagnoses into the hands of people in rural Africa and Southeast Asia. Ohio State will license the technology to a medical diagnostics company for further development, and Badu hopes to be able to test the strips in a clinical setting within three years. The Chemistry Club helps provide chemistry and science students with assistance in furthering not only their education, but also their exposure to opportunities within their field. This organization provides support by holding social events, inviting speakers, and doing outreach to encourage future generations to take interest in the sciences. Chemistry majors are encouraged to enroll in Chemistry 4998 or 4999 (Honors) to obtain undergraduate research experience. Students receive a grade for credit, rather than S/U ranking. Research projects are most productive when conducted through two semesters. Contact a research advisor for more details. Research Experiences to Enhance Learning (REEL): The Ohio Consortium for Undergraduate Research (OCUR) is comprised of the chemistry departments of 15 educational institutions spanning the State of Ohio, including community colleges, liberal arts colleges, and research universities.